For over 30 years, the REACH program has helped low-income families keep their utilities services turned on in times of hardship. The REACH program helps you pay for energy during a crisis. REACH provides an energy credit for up to $300 based on the past due bill amount. A non-profit organization runs the REACH program from 170 offices in northern and central California. PLEASE NOTE: REACH is available only once within an 18-month period except, in some cases, for the elderly, physically challenged and terminally ill. Determine whether you qualify. Visit REACH Criteria and Guidelines. Contact the REACH program at 1-800-933-9677. You can support REACH through regular donations or with a one-time contribution. Make a one-time tax-deductible donation online or choose another way to submit a donation. Visit Dollar Energy Fund. For general questions, contact the PG&E Customer Service Center at 1-800-743-5000. 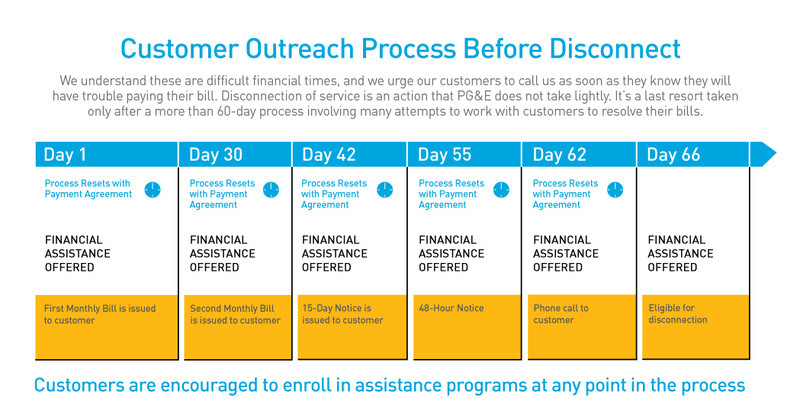 Learn more about the many steps PG&E takes to work with you before disconnecting service. View Outreach Process Before Disconnect. Receive notice of a friend or relative’s overlooked PG&E bill to help them avoid service shutoff. Find out how to help people in your care keep their service on during illness, hardship or other crises.